Another effing musical. I do love them, but over-done is an understatement in the past year when it comes to the genre. I blame Glee. 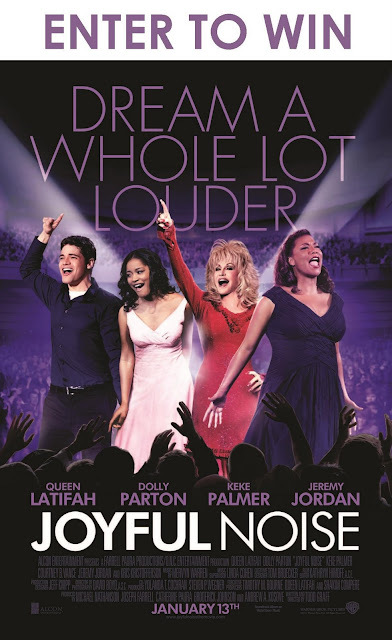 So if you are not tired of the singing shenanigans then please do feel free to enter this contest to win 2 tickets to an advance screening of Joyful Noise starring Queen Latifa and Dolly Parton on Wednesday January 11 at 7 PM in Calgary, AB. If you had to choose between Queen Latifa and Dolly Parton to play you in a biographical film who would you pick and why? I am prepared to be fascinated by your answers. If you are entering your name in the comments section please include your email address for winner notification.